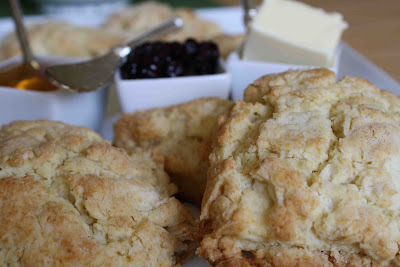 I was perusing some of my favorite blogs the other day and came across a wonderful scone recipe at La Bella Cook. I immediately started craving them and after putting water on for a pot of tea, I started making them. The recipe comes from Dorie Greenspan and I, along with Bridgett at La Bella Cook, left out the currants. I like to add flavor to my scones with what I serve alongside them. Today it was a blueberry spread, butter and sage honey. Had I had any clotted cream on hand, it definitely would have made the mix. The final piece to this delicious breakfast was a large pot of PG Tips. Enjoy! Mix egg and cream together and set aside. Place flour, sugar, baking powder, salt and butter in a food processor and pulse until crumbs form. Turn out into a bowl and pour the wet ingredients over. Gently fold together with a spatula until just combined (do not over mix). Turn dough out onto a board dusted with flour and form into a circle. Cut the circle into 6 - 8 wedges and transfer to a baking sheet lined with a silpat or sprayed with cooking spray. Bake for 22 minutes and cool slightly before serving and enjoy! What a delightul scone recipe! Oh, I can almost smell them baking. A friend gave me some apricot jam that would be perfect with them. sound moist, mine always turn out dry. These look fabulous!I bet they would be so good with coffee! Great work! Weren't these just perfect with a cup of tea? I am hopelessly addicted and this post reminds me I need to make another batch this weekend. Next time, definitely try them with some clotted cream....talk about addictive! I'm glad you were happy with them. How funny that we both posted scone recipes on the same day. :-) I agree...the flavor belongs on the scone, not in it. Dorie's scones are my favorite! Glad you tried them. I do add in craisins and orange zest...but having flavors on the side sound good too! I don't make scones nearly enough - I should try these out! Mmmm I've made Dori's scones and they are wonderful! Yours look delish! Thanks for your sweet comments on my cooking blog. I find it funny that the blog was created for my sisters, s. in-laws and myself to share but... 2 of the whopping total 3 comments the blog has received are from you! Thank you for your support. I love what your profile says, your food philosophy is verbatim to mine and I love that. I didn't already say that, did I?? Okay, and who wouldn't love a Cream Scone? ?